Size G hook throughout entire pattern. Dark Gray/Gray Brown (taupe): 20-24 oz. Light Gray (linen): 18-20 oz. Using dark gray, ch 41. 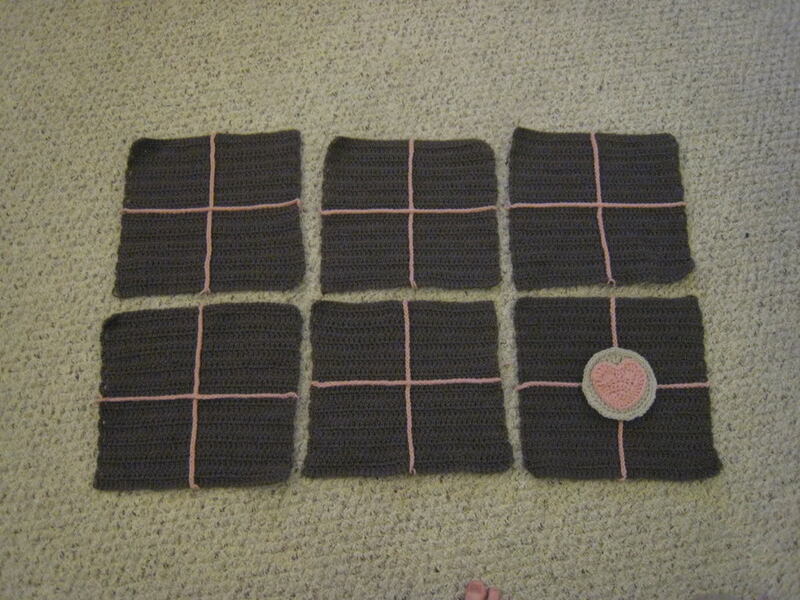 Row 1: dc in 4th ch from hook (count as 1st dc) and dc in every chain to end, ch 3 and turn. Using light gray, ch 20. Row 3-4: DEC, dc in 3rd dc and dc in every dc until 3rd to last dc, DEC again, ch 3 and turn. Row 7: DEC, sc in 3rd dc and sc in every dc until the 3rd to last dc, DEC again and finish off. Using light gray, ch 31. Row 4-6: DEC, dc in 3rd dc and dc in every dc until 3rd to last dc, DEC again, ch 3 and turn. --Make 8 double corner pieces; finished size is about 5.5x11 inches. Using light gray, ch 16. --Make 8 single corner pieces; finished size is about 5.5x5.5 inches. Row 6: slst in 1st sc, 5 dc in next sc, slst in 3rd sc, slst in 4th sc, 5 dc in 5th sc, slst in 6th sc, ch 3 and do not turn. Border: dc in each row to point of heart, 3 dc in point, dc in end of each row to beginning of 5 dc shell,*1 dc in 1st two dc, 3 sc in center (3rd dc), 1 dc in next two dc*, sc in space between shells, repeat from * to *, slst to join to 1st dc. Finish off. --Make 6 hearts; approximately 3 inches in diameter. Using light gray, ch 4, slst to form ring. Row 3: ch 3, *2 dc in next dc, 1 dc in next dc*, repeat from * to *, slst to join. Row 4: ch 3, 1 dc in next dc, *2 dc in next dc, 1 dc in next two dc*, repeat from * to *, slst to join and finish off. Using pink, ch 44 and finish off. --Make 12 ridges; finished length about 14 inches. --Center heart on circle and join. --Center heart/circle pieces on background piece and join. Use polyfil to add dimension before finishing off. --Join single corner pieces to double corner pieces. Long side of double corner piece to both long sides (long sides=sides without DEC). Use pictures as reference; resembles a pyramid. 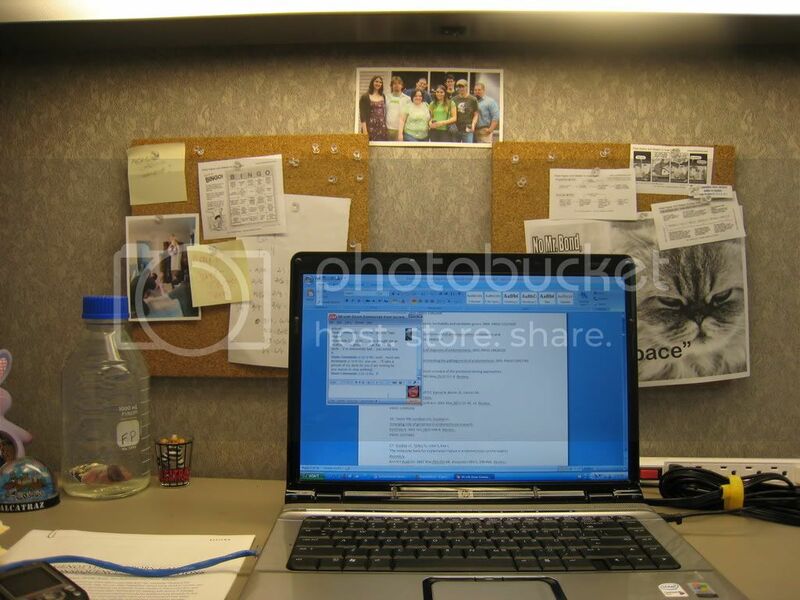 --Join background pieces (sides) to form cube. Orient hearts as desired or according to reference. Fill with polyfil before finishing off; do not over stuff. --Center middle pieces on cube and join. Use polyfil to add dimension before finishing off. --Align single corner piece on cube and join single piece only (stitch the entire perimeter of the single corner). Use polyfil to add dimension before finishing off. --Fold down double corner piece and join to cube. Use polyfil to add dimension before finishing off. --It is not necessary to weave in the ends; all ends can be hidden within the pieces of the cube or the cube itself. --When joining pieces, you may (probably will) need to stretch and shape the pieces to get the desired look. --Do not over stuff with polyfil; if more polyfil is needed even after finishing off, carefully add through dc. If more polyfil is needed a pencil or chopstick is useful for adding polyfil between dc. --When joining background pieces or sides, attaching middle pieces, heart/circle, and corners, ridges are a good reference point for alignment. --Good luck and be patient, the final product will be well worth it! --PM sprocketfish with an email address for the pdf of this pattern. --If you have any specific questions about the pattern or changes, please PM (sprocketfish) or email me. If anyone completes this pattern, please post pictures or PM and let me know if the pattern was helpful. --Please feel free to share this pattern, but please acknowledge the original source. Thanks! 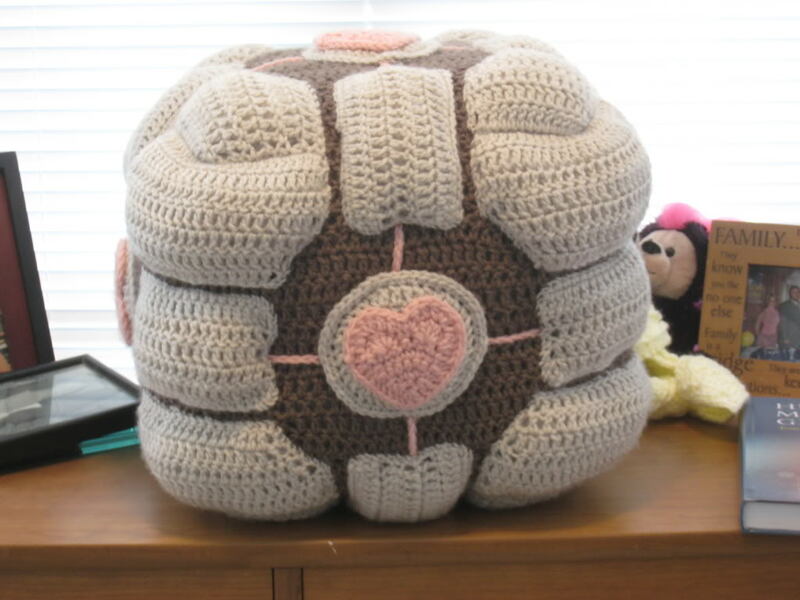 I'm a bit lost as to what a Companion Cube is (I know it has to do with a game, online, I believe), but that is pretty fricking awesome! The cake might be a lie, but the cube lives forever! oh and I would love the pattern if you'd like to post it here! Oh, i love you for this. I'm seem to be having an outspoken day, but that's not always bad. If I wisted things, this would get wisted about a hundred times over. 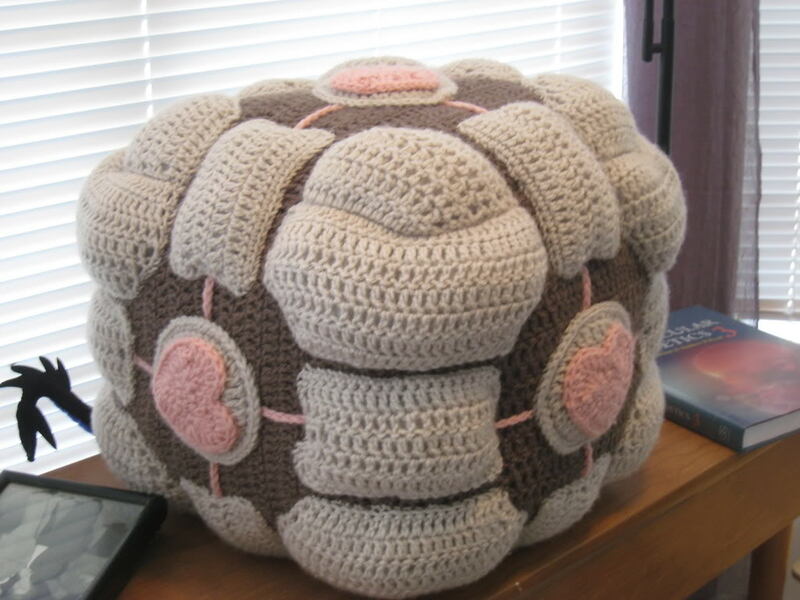 if I knew how to crochet...my boyfriend would LOVE this. Amazing! Psshht! This is fantastic! Hot topic for sure; this Rocks! 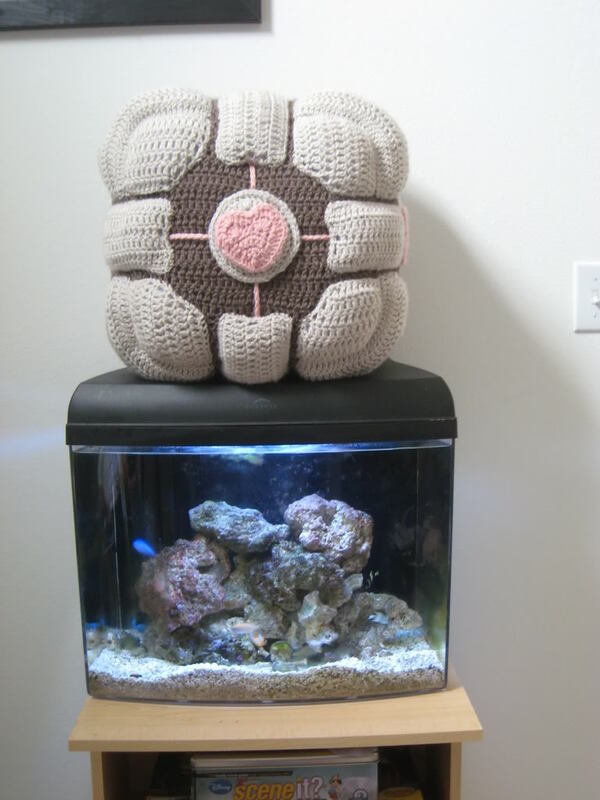 Yeah, I definitely want my own companion cube!